Nancy Zieman Productions, LLC’s FREE block of the month program is a great way to finish a quilt in manageable monthly installments. One block at a time is an easy approach to creating a larger quilt. Whether you are a beginner or seasoned quilter, a block of the month is a great opportunity to stitch. In 2018, Team Nancy Zieman is offering a fantastic quilt! Unfortunately, we cannot show you the finished design just quite yet. We’re keeping it a mystery! After a few months of wrangling with the perfect theme for the 2018 Mystery Quilt, Team Nancy Zieman decided to honor Nancy’s legacy with a quilt titled, She’s Our Star. Today we’ll introduce you to the Block of the Month and let you know what supplies you’ll need to create a fantastic star-based quilt for 2018. Though we won’t be sharing all the blocks today, we will be posting a new quilt block tutorial starting in two weeks, on January 20. 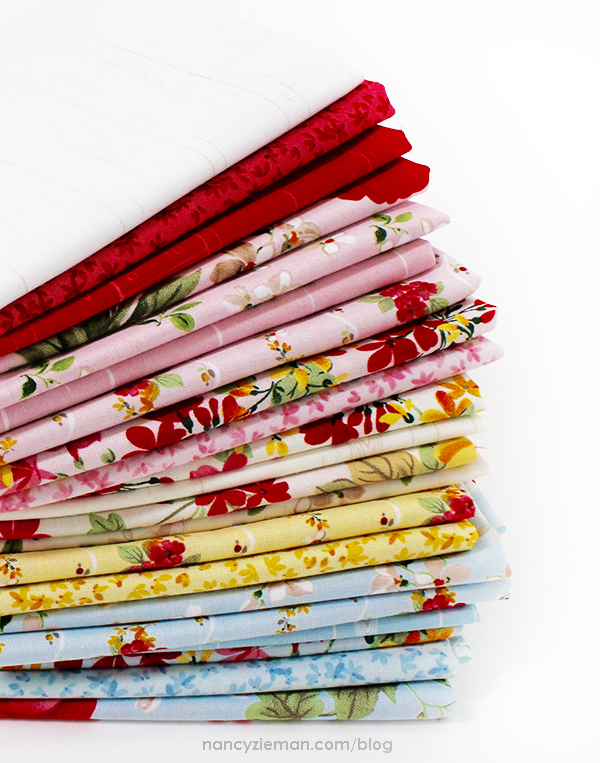 For the first six months in 2018, the NZP Team will guide you to create two blocks each month cut from Farmhouse Floral fat quarters* (18″ x 22″ fabric rectangles) and background fabrics. Of course you may use any other 21-fat quarter collection and neutral background fabric. With the gentle florals and calming prints, the palette for the 2018 quilt evokes emotion. When you see this quilt, as we’ve stitched it, it is soft and serene, just like our star, Nancy. Get ready for the 2018 She’s Our Star Block of the Month! 2018 She’s Our Star Block of the Month kicks off on January 20, 2018. As always, there’s no cost to join and no need to formally sign up. One block will be stitched in two colors each month. 2018 She’s Our Star Block of the Month is fat quarter friendly. 2018 She’s Our Star Block of the Month project lasts only six months. Well, not really, but do make certain that you have a sharp blade in your rotary cutter. Gather your cutting mat and ruler. The other main notion used each month is the No-Hassle Triangle Gauge. You guessed it! Star blocks will have a couple triangles here and there. Best news yet, they’re easy to create with the No-Hassle Triangle Gauge. Did you follow along in 2015, 2016, or 2017 for our Block of the Month projects? If you finished part of all of the quilt blocks or the entire project, please share photos. We’d love to see and share them! Post your pictures to my Facebook Page or email them to [email protected]. In 2015 we jumped in making two blocks each month. The blocks were bold and bright. Using various templates from Clover USA, we created an interesting large sampler quilt. Join the fun anytime. The patterns are free and online at the 2015 Adventure Quilt link on the blog. In 2016 we finished a block of the month project, which featured the Carefree Curves Template set. The possibilities are endless with this template; it is one of our favorites. We used pieced fabric strata each month to yield a very scrappy finished quilt. Just like the 2015 project, this Block of the Month is always free and online at the 2016 Quilt Extravaganza link on the blog. Using traditional quilt blocks and quick-piecing methods in 2017, we created a sampler from Nancy Zieman’s Garnet Fabric Collection. You can see many variations of these blocks in the photos section of the Nancy Zieman Productions, LLC Facebook page. Grab the complete block sewing directions at the 2017 Fat Quarter Mystery Quilt link. Watch for the first 2018 She’s Our Star block of the month on January 20! See this mosaic come into focus over the next six months. Watch No-Hassle Triangles (Part One and Part Two) on Sewing With Nancy online. Will there be any more BOM for 2018 or are there just going to be 6? Hi Anne. No there will not be anymore blocks for 2018. The last month included the setting instructions for putting the blocks together. If you make two blocks each month using different fabrics for each one, then you will have 12 – 12″ blocks plus the borders which will make a nice-sized quilt. I have really enjoyed making these and hope to put them it together soon. Nancy’s fabrics are beautiful and such nice quality to work with. Fun! Miss NANCY! She was a STAR! Glad you are featuring this fabric and quilt. Did something happen to Nancy that I missed please let me know. I’m so sorry to share that Nancy Zieman passed away on November 14, 2017. I know it is very late to get in on this BOM, but I just saw it. Do you have the back kits and is it possible to get them? I always watched Nancy on TV and enjoyed every program. She is truly missed! Didn’t the 2018 Mystery BOM begin January 20? How do I sign up as I may have missed email? Thank you. You can sign up by going to the top of this page and on the right it has a box for your email. Sign up for updates! Did I miss the February block directions? I can’t seem to find that one. Thank you! What an appropriate name for this quilt. She was and always will be that star leading the way. Thank you Team NZP. What is the finished size of the quilt? I’m doing this, love the 1st pattern, fabrics & Nancy but need to know the size, please! Can’t wait to see what you’ve planned. The fabric line is beautiful!! So nice that your continuing this tradition! I still feel a sadness at the loss of Nancy. She introduced to us a love for sewing ..whether it be garment, crafts or quilting. She will be greatly missed. I look forward to participating in the quilt of the month blocks. I watched “Sewing With Nancy” yesterday morning with a heavy heart. She has been a part of my life since my children were little. (They are all grown up now.) What a lovely, talented lady who is greatly missed. Thank you. I am looking forward to honoring such a gracious lady. I am so happy you are continuing on with her memory. Thank you Team NZP. I am very excited to use her new fabric for this as well. I know I will think of her every time I look at my finished project. The fabric is beautiful, I cannot wait to see the finished quilt. What is rh e finished size if you complete all blicks in this BOM? I definitely will do this in memory of Nancy who was and still is an inspiration to all who love sewing. Definitely doing this. Beautiful line of fabric recommended. I immediately ordered the fabric as soon as I got the first email. LOVE this line! I loved doing the blocks last year and can’t wait to start this one! Looking forward to the 20th. Thanks for continuing these quilts. So excited to try this line–Thank you Team Nancy! I love this fabric collection but have to many planned quilts now to start this. But I will save all of the posts for a future time. Thanks for carrying on Nancy’s name and tradition. Will definitely try to make this in memory of Nancy. Her inspiration lives on. This will be fun to try!! !